In New York, play readings are used as an opportunity to fine-tune a script or to sell it to an actor or production company. The environment there, more workshop-like than well-oiled performance, doesn’t always lend itself to a quality night of entertainment, but it can bring about star sightings, and a lucky few can claim to have been there when the script, now playing on Broadway or interpreted for the cinema, was first incubated. Here in the valley, audiences have been able to enjoy the polished results of that East Coast vetting process and regular star sightings from actors like Pamela Sue Martin, Jim Jarrett, Claudia McCain, Patsy Wygle and Keith Moore and others who call Sun Valley a retreat from the theatrical outposts of New York and Los Angeles. The playwright, Conor McPherson, has been hailed as one of Ireland’s premier playwrights and “The Weir” was the recipient of the Olivier Award in London for Best New Play and then played on Broadway to rave reviews. 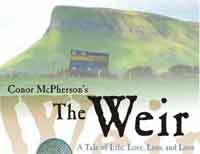 In this tale of the supernatural, McPherson demonstrates his remarkable skill as a riveting storyteller. In a bar in rural Ireland, local men swap spooky stories in an attempt to impress a young woman from Dublin who recently moved into a nearby “haunted” house. However, the tables are soon turned when she spins a yarn of her own. It’s a classic example of what the community has come to expect, along with free wine and cookies. “The reading series began because we wanted to explore the texts of interesting and important new playwrights in a way that is affordable to produce,” explains Kathy Wygle, founder and manager of nexStage. “We can also select cutting-edge material that otherwise would not be able to be seen in this valley. Wygle says it is the informality of the setting that entices as well, giving people a glimpse at the process of preparing a play for full staging. It always makes for thought-provoking theater. As was found when Charlotte Hemmings read “My name is Rachel Corrie,” the story of a young American activist killed in Gaza by an Israeli bulldozer, a reading can generate powerful emotional responses, despite the lack of props, gestures, sets and sound effects of a full production. Controversy swirled for months after the reading, which was attended by Craig and Cindy Corrie, the woman’s parents, who turned over emails and journal entries that were cobbled into her story. Some labeled all associated with the play Palestinian sympathizers while others criticized the backlash as disrespectful and inappropriate. But as they say, the show must go on, and Kane continues to bring timely, amusing, engaging and, yes, sometimes infuriating readings to the theater. “The reason I wanted to start the series is because I had attended a lot of readings in New York City when working in the theater there and always thought they were a lot more compelling than they appeared,” he says. “It also gave me the chance to hear great new plays in an informal setting and almost share the evening with the actors in a way that is not possible when you attend a production. Like Wygle, he feels the setting and style has encouraged what he describes as a strong and attentive following. Pamela Sue Martin says she enjoys being invited to read or just to attend these readings because of Kane’s selections. Where: nexStage Theatre, Main Street, Ketchum. 6:30 p.m. Doors open at 6 p.m for wine and cookies and mingling before.